I am happy to share my supplier reviews hoping these will help other bride-to-be's who are looking for options and feedback. The first supplier shortlist post I did was my hair and make up artists shortlist. And now I am sharing with you my party venues options and shortlist. I have already booked our wedding party venue. It will be at the Light of Love Events Place in Quezon City, and I could say that we don't have any regrets booking the place. I like this place ever since I saw its photos online. You may see here my stories of our very first ocular and when we finally booked it. Value for money: Does it include packages that will make my life easier and will cut down on my cost? Not too stiff: We do not want it to look too formal so we do not want a ballroom. We also do not want the venue to look too stiff as we want a fun and perky party. Ambiance: Is it beautiful? Is there anything special with the place compared to other venues? Space: Is it big enough and will not be too tight? Tight venues are no-no for us. Service: Will the staff be of great service to us attending to our queries and needs before and during our wedding day? Will they make our big day stress-free? Food: If food packages are included, are they good enough? Is the price worth it? Parking: This is important. Will our guests not have difficulty parking? I have researched so many venues and I will try to lay them all out here for you. I will quickly do a run-down of all the venues I looked at (online) and my actual shortlist. If you want to skip to the shortlist you may scroll further down as I have pretty much included in this post all the venues that I have encountered along the way, including those that I still looked up even after I have booked our chosen venue. I started researching on reception venues way back before we even got engaged. And when we finally got engaged, it was really easy to narrow down my options having known what I really want and look for in a venue. We actually did not have difficulty in deciding on this one given that this is a major part of our big day. Blue Gardens located in Quezon City was actually the very first venue I looked into. It has its own Worry-Free Reception Packages and they are pretty good and affordable. You can also choose between the open garden and the fully air-conditioned Chateau. They also have a Ceremony Package and venue if you want to hold your wedding ceremony there. I was considering the Chateau because I would never risk an outdoor venue no matter what the wedding month is. I have made a mental note of Blue Gardens as being one of the potential venues for our future wedding. But it really didn't end up in my shortlist. Check them out at thebluegardens.blogspot.com. Ibarra's Catering offer different venues for functions with affordable and comprehensive packages. The venues are: Plaza Ibarra (QC), Bella Ibarra (QC), Ibarra's Garden (Ermita) and Villa Ibarra (Tagaytay). Their packages are very attractive since they are practical, even more affordable than Blue Gardens'. I was seriously considering Ibarra's since I found their packages because I could not really find anything that would beat their packages and rates. But all of that changed when I found our venue. If ever, it would be Ibarra's Garden that I think would be an ok venue choice for us among their venue options considering the number of guests and casual feel of the reception that we want. We actually wanted our venue to just be in a bar, but the older people for sure will not enjoy it. So we had to find an alternative where we can still do the partying we want. Check them out at www.ibarraspartyvenues.com.ph. Casa Camba, along with Ibarra's and Blue Gardens, was part of my top choices when I was in my early part of researching. It offers wedding packages and has its own catering - Robert Camba Catering. The venue is like a garden venue, but covered. 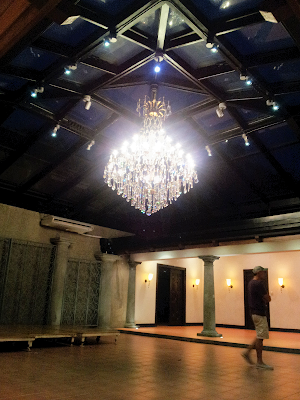 The venue was a house in New Manila, QC converted into an events place. They call it a Home Garden Venue. Comparing their packages with Ibarra's including the food menu, I could say that Ibarra's was more sulit. I think it's ok for other events like birthdays, anniversaries, or baptisms, but not for my wedding. Check them out at casacamba.com. Jardin De Miramar located in Antipolo City was simply one of the venues that I found through browsing blogs and reviews. I could not really remember why it didn't belong to my initial shortlist. Maybe it just didn't have the this-is-it feeling and it was far. I was not really impressed by anything also. Though they also have reception packages available. Check them out at jardindemiramar.com. This one made it to my notes in Evernote as an option, however I immediately crossed it out due to reasons below. I did not find any website, but you can look for them on Facebook. I knew Manila Polo Club would be expensive, but I checked it anyway out of curiosity. And it turned out not be not so expensive as I thought. However, they do not offer wedding packages. Also, I could not remember if you need a member to sponsor you to be able to hold an event there since it is an exclusive club. Maybe yeah? Check them out at www.manilapolo.com.ph. Gazebo Royale is a garden events venue with different Gazebos to choose from, the Champagne Hall (biggest - 400 pax), Phoenix Avenue (mid-sized events - 150 to 280 pax), Bamboo Grove (small intimate events) . It also has accredited caterers to choose from. But since it has no air-con, it's a no-go. However, to those who are looking for an affordable garden venue, this place is worth checking out. Cons: No air-con - and it's non negotiable for us. Check it out at gazeboroyale.com. I considered it just because we wanted a casual feel for our wedding party and I didn't want it to be too stiff. However, their wedding menu is only very limited and I did not find the rates practical. Also, my mom's feedback on this place is not good. She said it was unsatisfactory, she had complaints from the chairs to the temperature to the food. She said is is not worth-it. Well this was her opinion based only on her first visit (and most probably last) at the place. And since it's in Tagaytay and it would be costly to hold an out of town wedding, I crossed it out. Now here are some of the anti-reception venues that I have found after I have booked Light of Love. As mentioned, we initially wanted to do our party in a bar but we let that idea go because we had to consider our older guests, and bars are not really specializing on wedding events so many things can possibly go wrong. You might just want to consider any of these if you want an intimate and casual affair. It's also nice to book a beautiful cafe or restaurant because then you wouldn't have to do any styling at all! At first I became a bit hesitant about LOL because I have always known in my heart that having a non-traditional wedding reception was what I have always wanted. And having found these venues now kind of confused me for a while there. However, thank goodness that none of these venues really was a perfect fit for our event due to the size and service requirements. And that's when I happily let it go. I just love love love the interior of this place! Had it been any bigger, it's so perfect for us. However, it can only accommodate about 80 guests. It really opened its place for wedding bookings. Wine Bar is located in El Pueblo Ortigas where just downstairs you can find Cafe 1771, a shabby chic cafe also open for wedding functions. 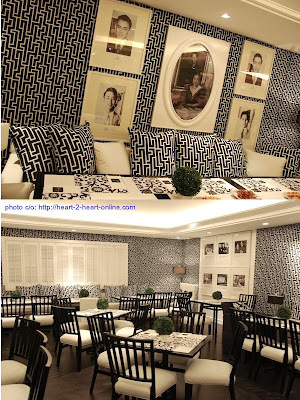 Romulo Cafe has an exquisite and classy black and white interiors. They have a Tomas Morato branch and a Jupiter Makati branch. 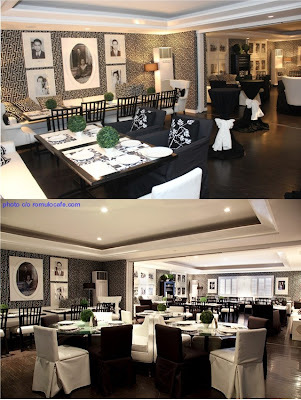 I have seen a blog wherein their wedding reception was held at the second floor of the Makati branch. And I feel awful of the bad service experience this couple got on their wedding party. The venue was not ready when they arrived because the previous function ended later than it should (yes on the actual day! ), their cake came out melted, the manager in-charge was not the one they talked to during preps so many things they have agreed upon did not happen. But she reiterated on her blog that if you are going for an anti-reception venue, you must not expect the service of a hotel or a typical event catering. And this she acknowledged and just made the most of their day. I just wouldn't know what to do if that happened to us on our big day. Our situations are different because their wedding preps are not as long as ours. With our 1 and a half year prep spent on researching and comparing and deciding and sorting all odds and ends, I wouldn't accept something like that drastic happening on our party. Thanks for being patient! 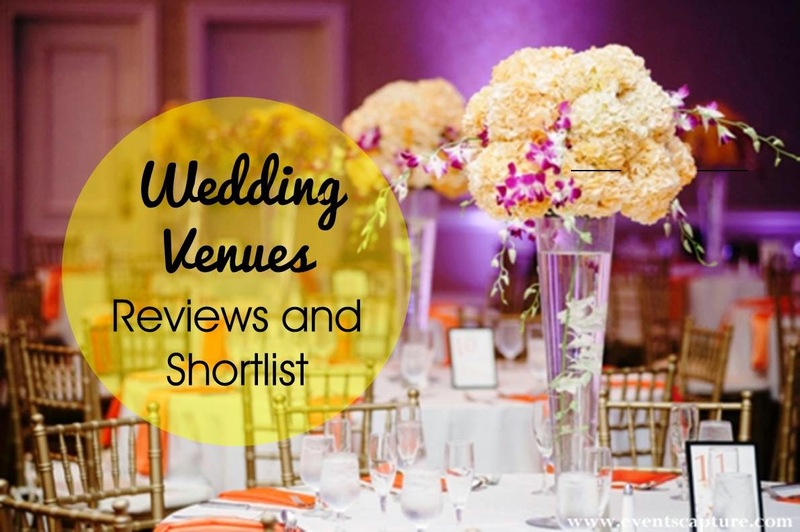 Now we're down to my actual party venues shortlist! Finally! The Grand Terraces is a Balinese inspired events venue in Commonwealth Avenue, QC. It has several indoor and outdoor venues to choose from depending on the size of the event. There are Lotus Hall, Palm Hall, Grand Pavilion, Lotus Garden and Venus Garden. If Light of Love's Atrium has its glass ceiling and huge crsytal chandelier, Grand Terraces boasts its 90-bulb chandelier for indoor venues. To be honest, I think the place looks beautiful but I can't see anything special about it. And one of the wedding coordinators I have talked to told me that she didn't like Grand Terraces because there's no big area outside the function halls like in Light of Love and Oasis where they have gardens. The Grand Terraces also does not offer packages with complete amenities like the other venues and it only has one caterer which is VS&F Catering. Also, no one's replying to my inquiry then, considering that I don't really have the time to wait for slow responses, I just let them go. Not to mention their packages are more expensive - this factor really helps me decide without looking back. And it's one out from my shortlist. You can check them out at www.the-grandterrace.com. The Pergola also offers wedding reception packages like Light of Love's, but with the exact same inclusions Pergola's packages are more expensive. I don't know why. I am not impressed by the venues as well. Check it out at www.therpergola.net. Oasis Manila also offers similar packages as Light of Love with almost the same accredited caterers. If Light of Love's Atrium has a glass ceiling and huge crystal chandelier, and Grand Terraces' Lotus and Palm Halls boast of its 90-bulb chandelier, Oasis' Orchard has white ceiling drapings which also look pretty. However, in my heart it's still LOL's Atrium that's more appealing. I just cannot let go of Atrium's glass ceiling and crystal chandelier. So the next thing to look at? The rates! Comparing the package inclusions and menu (I used Hizon's package as basis since it's what we are planning to get in LOL also), Light of Love was still a bit cheaper. I think by P10,000. Oasis has extra freebies like 2 hrs photo booth (which I do not want) and a projector & LCD, but still it wouldn't cost me 10k. If Oasis' package rates turned out to be better (meaning cheaper with same inclusions), for sure it will be quite a dilemma. But since it's more expensive and I like Light of Love better, it's a no-brainer. We didn't even bother to visit the place. Check them out at www.OasisManila.com. I have seen Enderun Colleges in McKinley Hill being quite a favorite wedding reception venue and I wondered why? It's a school! So I checked it out of curiosity, and I realized why. It immediately joined my shortlist and it has actually came head to head with Light of Love. I sent an inquiry and tried to book an ocular, but the event officer I am talking to can only see us during office hours and this was a conflict with my schedule. I continued researching about weddings at Enderun before we actually go there for an ocular. Enderun also has this function hall they call Atrium which is adorned with clean interior, bricks, and big glass windows with a nice view of the Courtyard outside. It's slick and beautiful, and again it's perfect for the non-formal venue we want. The package only includes the venue rental and the food which is exceptional as may would comment (Enderun being a n international culinary school, it has to be). So I had to do the math for additional expenses like cake, lights and sounds, bridal car, styling, etc- all of which are already included in Light of Love's packages. I also considered the hassle of adding these suppliers into the list of the suppliers I need to get, and research and compare - the works! I have read some comments that there were events when the waiting staff were not too attentive. The waiters are students, most foreigners and rich kids, so you can see why. At this point, budget-wise it's still ok and can still be considered. But the deciding factor really was: the banquet officer confirmed that this place cannot accommodate 150 guests and we had to transfer to their tent venue which's rental is surely beyond our budget, or extend the venue to the Courtyard (the open area outside the Atrium) which I do not like and would add more venue rental cost too. So I had to let Enderun go. We didn't get to visit the place since we knew that it would not work for us anyway. After that tough deliberation and all the research and inquiries, we're left with my top choice! My top venue choice even before we got officially engaged. Light of Love still won! I am happy. I guess it's meant to be. I remember when I was still searching for potential wedding reception venues way back (before engagement happened), when I found Light of Love I just stopped looking further. I just kept the package rates sent to me by Steph in my files. And waited till I can go over them again, act on them, for real. Even though Light of Love was the only venue we actually visited, I know that we have considered every aspect and every option we know before booking the place, and we're very happy with our decision. Light of Love is an old mansion in Santol St., Quezon City converted into an events place that has different halls and gardens to choose from: Atrium, Love, Trust, Integrity, Loyalty, Cherish, The Garden. When I saw Atrium's photos, I immediately fell in love with its glass ceiling and huge crystal chandelier. It's size is also perfect for our party of 150 guests. It can accommodate up to 180 pax, but that would be really packed. 150 is the ideal number, but knowing that it wouldn't be impossible to fit excess guests (if ever) gives me a peace of mind. And I feel ok not getting a stylist (I never really thought of getting one anyway) and just let the caterer's styling prettify the place, Atrium looks good on it own. This was taken when we went back there to book. I have seen a wedding function in Cherish and it was beautiful. It's a garden venue which also is ideal for ceremonies. It was really beautiful. Adjacent to Cherish was Love which they keep vacant when a function is going on in Cherish as a back-up in case it rains. During our first ocular, there was a wedding in Atirum, the second time we went there was one in Cherish and it rained! They had to transfer to the Tent which was so much hassle for everyone. I heard a guest complaining why they didn't go straight to the Tent since it looked like its gonna rain. It's the reason I do not want to risk having an outdoor venue, ever. Yes it is beautiful in the garden and all, but aside from lack of air-conditioning, I do not want to ruin our big day because of rain. Most of the weddings I have attended, it rained. It's a symbol of blessing and it's good. And if it rains on our day, we know we're ok. The ambiance of the Atrium does not seem too formal to me. It's not a ballroom and is quite a flexible venue space to work with. The glass ceiling and big crystal chandelier made it so elegant and unique. It's perfect for partying under the stars! And with this space, I can have a band, we have a stage, we can have a dance floor which we certainly cannot do in the (anti-reception) cafes I mentioned. Light of Love offers reception packages with a number of caterers to choose from. It also has enough parking and a big open space of lush garden where guests can wander around and take photos (not during the program of course). They also offer good payment terms. The account executives are also great, I have seen nothing but praises for them. Some of LOL's downsides are: They hold up to 3 events in a day; The location is quite hard to find. Aside from that there's really nothing I can think of. And we are just happy to have booked the place! You can check them out at lightoflove.com.ph. You can read my short blog post about booking the place for more photos. In the Philippines, wedding reception venues are a plenty. There are La Castellana, Baluarte de San Diego and Plaza Moriones in Intramuros if you want a historic wedding. Your other choices are 55 Events Place and the Light of Love Events Place in Tomas Morato and Santol Street in Quezon City, respectively, and the ever-reliable Oasis Manila which is located in San Juan. Choosing the right venue is a critical part of any wedding. When you have chosen the right venue, only then you can maximize such to your advantages. Preparing the wedding venue itself is equally important. Here are the right questions to ask so you can make the most of your carefully chosen venue. Thank you for sharing this. This will help me to decide which venue would suit for our theme and budget.